2017 has had endless reports about declining public health in the UK and the pressure on the NHS, and the Government faced intense criticism for its approach to tackling air pollution. The traditional social models are struggling. People are living longer and resources are finite. We can’t expect Parliament to solve everything anymore, we need to spread the burden of responsibility – and in a way that is effective and sustainable. Laws and penalties may help, but we need carrots too: everyone should feel motivated to play a part in preventing damaging outcomes to our society and environment. BetterPoints provides that motivation, and on an individual level, using mobile technology. We incentivise behaviour change and enable clients to manage those incentives and the relationships with their end users. We want people to do great things with our behaviour change platform, so we licence it to organisations in the public and private sectors that want to encourage people to do things differently and more constructively. This year, we have seen it put to impressive use. In Skelmersdale, the clinical commissioning group started using BetterPoints to encourage people to be more active. In Salford, the CCG is using BetterPoints to get schoolchildren walking at least 150 minutes a week. Bella Mossa won a Civitas award for its approach to tackling air pollution. In Italy, the city of Bologna had tried to reduce CO2 emissions by banning the use of polluting vehicles during the day. This didn’t go down too well with the public, so SRM, the local public transport authority, decided to try positive incentives instead. They used our platform to build Bella Mossa, a six-month programme that encouraged people to switch to more sustainable modes of transport. Between April and October, 15,000 people recorded more than a million sustainable transport journeys, totalling 3.7 million kilometres – almost 100 times round the globe. It’s calculated those journeys may have saved as many as 750 tonnes of CO2 emissions. 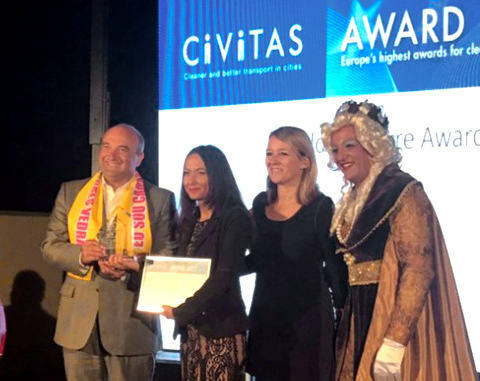 At the end of September, it scooped the European CIVITAS ‘bold measure’ award for its innovative approach to tackling air pollution. Accepting the award, Bologna’s Deputy Mayor, Irene Priolo, said Bella Mossa ‘has been one of the most effective tools to promote sustainable mobility in our city in an innovative, fun, and incentivizing way. Bella Mossa was funded by the European Commission’s Horizon2020 programme. It was so successful that SRM has commissioned a second programme themselves. Chris Tarrant dished out a Pride of Reading Award to our BikeSmart Reading team. Back in the UK, Bikesmart Reading, another programme funded through Horizon2020, encouraged people in Reading to travel more by bicycle. 65% of those surveyed at the end said it encouraged them to change their travel behaviour. “Having BikeSmart has encouraged me to cycle more often when previously I would have taken the car or bus,” said another. In September, BikeSmart Reading won the Healthy Streets Award for modal shift. 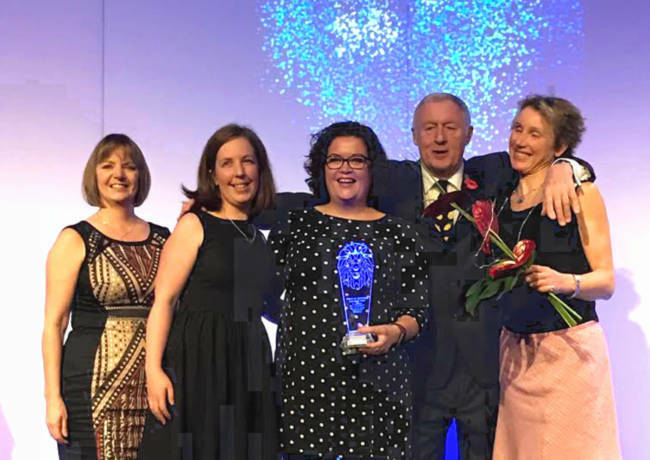 And in October, our colleagues accepted the Pride of Reading Award from TV’s Chris Tarrant. In Birmingham, over the summer, nearly 3,500 people took to cycling, walking or running for the Brum Breathes cleaner air programme. Between them, they recorded more than 20,000 activities. If those activities replaced journeys in a large car, they saved more than 20 tonnes of CO2 emissions. This year, we have won a number of important new contracts but also strengthened existing relationships. Our partners in Italy have commissioned new work in the wake of the successful Bella Mossa programme. And Birmingham City Council’s Cycle Revolution team has commissioned a Winter Cycle Challenge for the third year in a row. Birmingham is one of the UK’s areas of concern regarding national air quality objectives. And road traffic, particularly during peak times, is one of its biggest pollutants. Programmes like the Winter Cycle Challenge help by giving people positive incentives to make changes to the way they travel. Last year, participants in the Birmingham Winter Cycle Challenge collectively cycled 12,000 miles and burned around half a million calories. If each of those journeys replaced a trip in a car, they saved more than three tonnes of Co2 emissions. Ivis didn’t learn to cycle until she retired. These programmes also have real, personal impact. One app user, David, has become more active since using it. Mary lost weight and doesn’t want to get it back. Karen is the main carer for a mother with little mobility and likes the motivation to find time for herself. 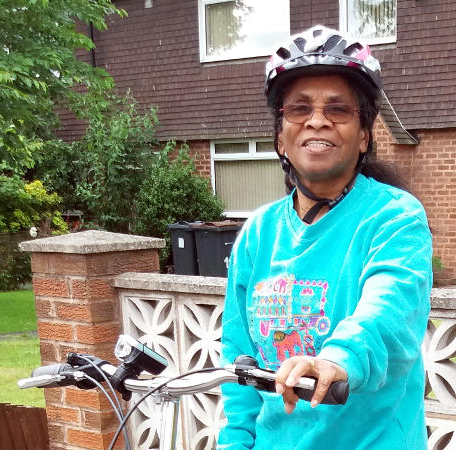 Ivis learned to ride a bike when she retired and now teaches others to cycle. We have made a lot of progress technologically, too. Our tracking capabilities are even better than they were, and we have enhanced user engagement significantly with a number of new features. This year, we introduced medals for reaching goals, leaderboards for the competitive amongst us and treasure hunts for exploring places in a fun and engaging way. We also introduced prize draws – virtual tombolas – as extra incentives to keep people engaged. Well, that’s 2017 in a nutshell. We’re really pleased with it and are excited to see what 2018 will bring. Until then, we hope you have a great Christmas and New Year.